Apartamentos Summerland, this hotel is in the quieter part of the resort and close to the town centre, meaning it’s a nice and relaxing place for you to stay if you want to be able to do activities and shop during the day, but still want somewhere nice and calm to return to on a night. Each room has its own terrace or balcony for your own private relaxation and you have your own TV and kitchenette so you can spend a cosy day indoors if you’re wanting to de stress and simply soak up the sun from your room. Alternatively, you can go down to the beach and tourist centre, or stay and lounge by the hotel’s swimming pool and bar for some real holiday relaxation. Because it’s near enough to the main centre of the resort to be convenient it’s great for family holidays who want to escape from it all but still have a lot of fun and good times. 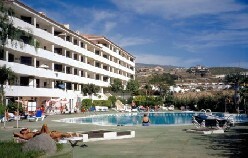 A relaxing resort close enough to the city centre for you to go for a day out, or simply relax in the sun.